The NDP is asking Canada's elections watchdog to immediately launch an investigation after a series of ads claiming Leader Jagmeet Singh lives in a multi-million dollar mansion popped up online in the lead up to Burnaby South byelection later this month. It's not the first recent attempt at spreading false claims about Singh. Late last year another story — which has been shared more than 5,700 times on Facebook — accused Singh of having links to Sikh militants. 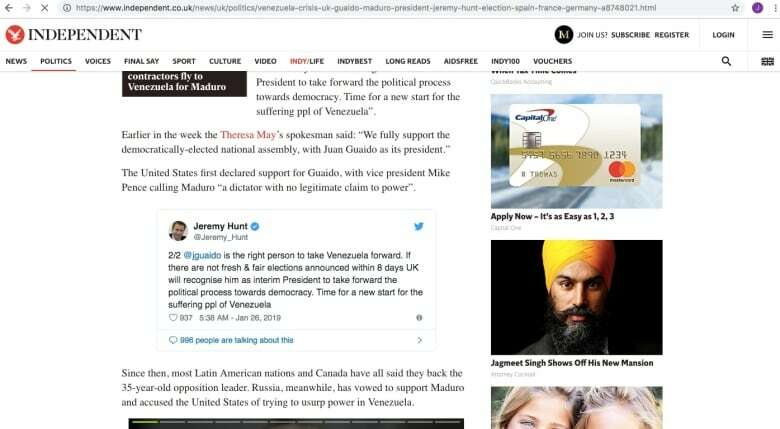 The NDP sent CBC News screen capture images that show the ad that appeared in the Courier also appeared on the History Channel website and the U.K.-based site for the Independent newspaper. Clicking on the link brings the reader to a photo gallery of more than 145 celebrities with mansions, including Alex Rodriguez, the Obamas and Rihanna. Singh said he's rented a "modest" place in Burnaby South. He's running in the B.C. riding's Feb. 25 byelection to secure his first-ever seat in the House of Commons. In a letter to Commissioner of Elections Yves Côté, the NDP's Director of Operations Jesse Strean Calvert writes that the party "is very concerned" about the "slanderous" ads and asks Côté to investigate possible breaches of the Elections Act. "These patently false statements are damaging to our leader, our party brand and most importantly threaten the free and fair election currently under way," reads the letter, obtained by CBC News. "These advertisements are clearly false and are intended to affect the outcome of the upcoming election." A spokesperson for the commissioner's office confirmed it's reviewing the complaint. "The allegations will be evaluated based on the case and a determination will be made as to how to proceed," said Irène Arseneau in an email to CBC News. Singh said he doesn't take the fake ads personally, but he is worried about the message it sends. "I am worried about the impact that could have when it skews people in a way that makes them make a decision that's not based on some fact," he told a crowd during a debate in Burnaby-South Wednesday night. "If someone disagrees with me, that's OK. But I want people to make a decision about their support for me, or a policy or the party, based on the truth." The opulent lifestyle allegation runs counter to the NDP's call for more affordable housing, a key pillar of its election platform. The party says the mansions ad was placed by the New York-based advertising company Taboola, which is responsible for many of the "around the web" and "recommended for you" advertising boxes located at the bottom of some online news articles. A spokesperson for Taboola told The Tyee the company takes 'fake news' seriously and would remove the content if it violates their internal policy. By mid-morning Wednesday, Singh's face appeared to have been removed from the Attorney Cocktail slideshow. ​The mansions file isn't the only false story about Singh circulating online. Another headline, spotted by Radio-Canada's Jeff Yates, claims Singh is wanted for terrorism in 15 countries. It links to an article authored by the site Native Born Canadian Movement (NBCM) which claims Singh "is part of the Sikh militant group." The rest of the story is simply a copy-paste of the Wikipedia entry on the 1985 Air India bombing. 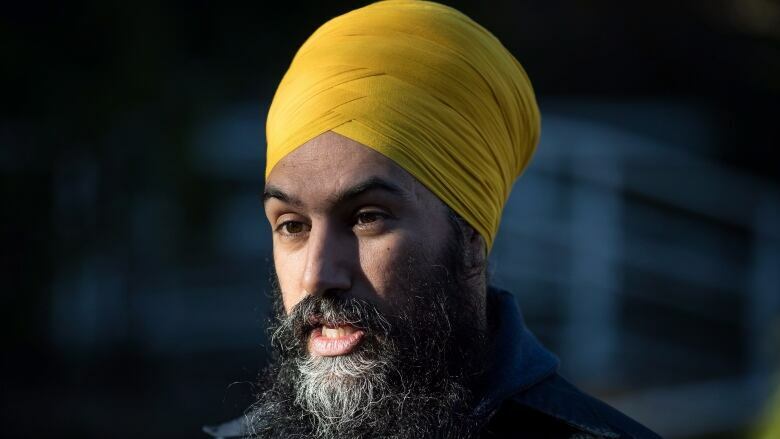 Singh has gone on the record saying that he accepts the Air India inquiry's conclusion that Talwinder Singh Parmar was the mastermind behind the deadly mid-air bombing that killed hundreds of Canadians — and that he thinks it's inappropriate for some Sikhs to glorify Parmar by displaying his photo. His denunciation came after he initially displayed some reservations on the subject in an interview with the CBC's Terry Milewski in 2017. The NBCM article, published back September, has been shared more than 5,700 times on Facebook and has generated more than 17,000 "likes," comments and shares on the social network site, which far outnumbers the NBCM's actual Facebook following. James Smith, a spokesperson for Singh's byelection campaign, said the party has already reached to social media platforms to have that story removed. NBCM makes its views clear on its YouTube channel: "This organization is simple ... if you are born in Canada you are a native-born Canadian ... this group is about standing up for native-born Canadians first." Concordia University professor Fenwick McKelvey, who studies how social media manipulation can alter political debates online, said the Taboola incident points to a grey zone in online advertising. "I think it's actually important because it points to companies that aren't well captured in a lot of our discussions about online advertising and internet accountability, but they're important players," he said in an interview with CBC. "It's an interesting grey area because it seems like they were advertising a clickbait story. So it just seems like it was actually poor sourcing and poor editorial, which isn't a surprise. Seemingly, that's the only way you can make money on the web ... not investing in content, but investing in scandal." Last week, Democratic Institutions Minister Karina Gould made a list of announcements regarding potential threats to Canada's democratic process, including the creation of a five-member panel tasked with sounding the alarm if it sees evidence the October federal election is being undermined by foreign actors. Canada's plan to protect election from outside interference a "good start"